There are other kinds of thOsais, of which we will discuss some of the main varieties. Prepare the thOsai batter as done for normal thOsai explained in the previous posting. Wash and clean the potato and pressure cook. Cut the onion lengthwise, green chillies and ginger into small pieces. Take oil in a kaDAi and heat. Add mustard and black gram dAl and allow spluttering. Now sauté onion, green chillies and ginger pieces for 5 minutes. Peel the potato skin, mash gently and add so that potato pieces are clearly visible. Add salt, turmeric powder and aniseeds and sauté for another 5 minutes till the entire mass becomes potato curry. Place the griddle on the oven and heat it well. Smear it with oil and then place the batter to make a bigger size thOsai but not as thicker as the normal thOsai but thinner as far as possible. Apply oil and roast. 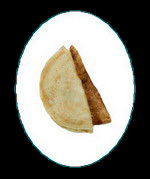 Lift the sides but do not turn the thOsai. Place a handful of filler maSAlA, spread and fold once. Apply oil and turn after 2 minutes and again apply oil and remove after 2 minutes. MaSAl thOSai is ready. This goes well with coconut chutney or onion SAmbAr. This is famous in Karnataka. For this we take 2 cups of raw rice, 1 cup of boiled rice and ½ cup of pressed rice (aval) along with a table spoon of fenugreek. The batter is prepared as done for normal thOsai. Note that here no black gram dAl is used. Soak the rice together with fenugreek for 2 hours or 4 hours as the case may be whether you grind in mixie or grinder but soak the pressed rice for only 10 minutes before you grind by adding water up to the level it immerses in the vessel under water and before grinding drain out the excess water from it. After grinding the rice and fenugreek together finely add the soaked pressed rice and rotate for just 5 minutes. Remove and allow fermenting overnight. 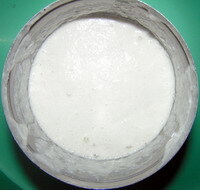 This batter is used to prepare thOsai in the normal way after smearing the griddle with oil. The thOsai should be thicker like a loaf of bread and not very large but of about 3 inches in diameter. However, after spreading the batter over the oil smeared griddle, close it with a lid for a few seconds. Lift the lid and check if the thOsai is slightly swollen. This indicates that the raw batter is cooked. Turn it and apply a little oil around the thOsai and remove after a few seconds. Set thOsai is ready. It goes well with chutneys and SAmbAr. This is famous in Andhra. Soak green gram dAl and rice in water for an hour together. Drain excess water and grind finely like thOsai batter with green chillies, ginger and salt. Remove and add the chopped coriander and curry leaves. 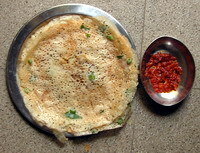 The batter is used to prepare like ordinary thOsai. Here we add a little ghI with oil to enhance the taste of peSaraTTu. 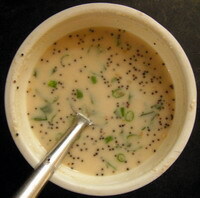 It goes well with miLagAippoDi, SAmbAr or chutney. The butter milk should not be too sour but slightly sour in taste. Add the butter milk and all the flours first and mix well with water to remove lumps. The batter should not be as thick as the normal thOsai batter but thinner as butter milk and not watery. Add salt, cut green chillies, curry leaves and mix well. Season with mustard. Heat the griddle and spread the batter from outer periphery towards the centre in quick succession after smearing the hot griddle with oil. Apply oil around and turn the side. Again apply oil and remove after a second. In normal thOsai we spread the batter from the centre of the griddle to the periphery whereas here it is exactly the reverse procedure since the batter here is thin. Must be taken when hot and if it cools it becomes rubbery. This thOsai goes well with miLagAippoDi and SAmbAr. The batter is prepared as above but here we take 1 cup ravA, ½ cup of rice flour and 2 tbs maidA in place of the flours indicated above. The thOsai is also prepared in the same way. This is liked by children. Here we take 1 cup of wheat flour, 2 tablespoon rice flour and ¾ cup jaggery. First we heat the jaggery with water over fire and dissolve it. After it dissolves in water completely, remove it from fire and allow it to cool. Mix the flours well and remove lumps. Powder a few cardamom seeds and mix well. The consistency of the batter is similar to that of normal thOsai batter but a little thinner. The thOsai is prepared with this batter as we do for normal thOsai. Instead of using raw oil, we mix a little ghI to enhance the taste. Must be taken when hot and if it cools it becomes rubbery. No side dish is required. This entry was posted on May 27, 2011 at 12:10 am and is filed under Snacks and Starters with tags aniseeds, aval, Bengal gram dal flour, besan, black gram dAl, boiled rice, cardamom, chopped coriander leaves, curry leaves, dosa, fenugreek, ghee, ginger, green chillies, green gram dal, instant thosai, jaggery, karaiththa thosai, maida, mustard seeds, onion, pesarattu, potato, pressed rice, rava, rava dosa, raw rice, refined oil, rice flour, salt, semolina, set dosa, set thosai, suji, thOsai, turmeric powder. You can follow any responses to this entry through the RSS 2.0 feed. Both comments and pings are currently closed.